AVEON is one of first Renewable Energy Company in India to be supported by National Institute of Solar Energy (NISE), under Ministry of New and Renewable Energy (MNRE), Govt. of India to conduct Skill development training programs. 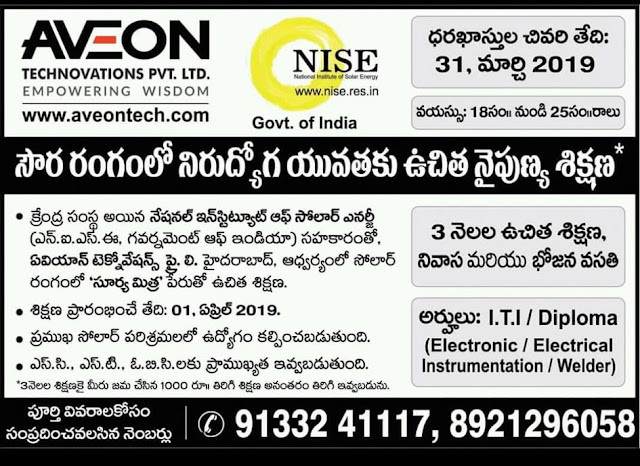 AVEON is one of first Renewable Energy Company in India to be supported by National Institute of Solar Energy (NISE), under Ministry of New and Renewable Energy (MNRE), Govt. of India to conduct Skill development training programs. We provide premier solar training for for solar installers, designers, sales people, and electrical professionals. Our Solar training courses are designed to guide you through your career from the theory and science behind Photovoltaics, Water heaters, and Water pumps through the advanced skills needed to safely and effectively design, size and install a full solar PV array or a Solar water heater or Solar Water pump. Further our courses train students for after saleIn addition to traditional live classroom courses, we offer online classes that can be taken anytime. Our distinct education delivery formats, flexible schedules, and wide selection of courses make it easy for you to take what you want when you want it. Last Date to Apply Online : 31st March 2019. Age 18 years to 25 years. Qualification : I.T.I / Diploma (Electronic/ Electrical/ Instrumentation/ Welder). Training Period : 3 Months. REGISTRATIONS OPEN FOR NEW BATCH OF SOLAR PV INSTALLER (SURYAMITRA) COURSE. FOR MORE DETAILS CONTACT 9133241117, 8921296058.